[New for 2012, 2nd St has closed up shop before the 2015 ice cream season] So in Friday's post about our family trip to the White Mountains, I mentioned that way way way up on top of Mount Washington, they had ice cream in their freezer. Some of you recognized it, but I didn't want to delve into it too much until I was ready --- ok, now might be a good time to apologize for not covering 2nd St sooner. I had every intention to, I really did, it just became this cyclical mess of finishing my vacation post vs doing this post, and vice versa (I know, I know, I'm over complicating things, let's proceed). Tada! 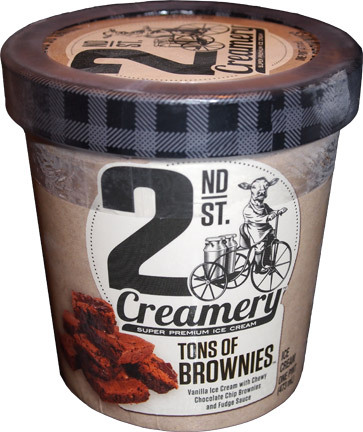 This is "Tons of Brownies", one of ten flavors from 2nd Street Creamery, new found purveyors of super premium ice cream... Well, maybe I shouldn't say "new purveyors". You see, I believe 2nd St is the secret super premium weapon of the fine folks of Wells Enterprises, better known to most of us as Blue Bunny. It makes perfect sense really. Despite making their main stream ice cream in pint sizes, they don't have any super premium products BUT then on the flip side, most companies don't mix main stream and super premium branding. So, here we are, Wells is ready to dish up the high octane stuff. Just wanted to take a quick peak at my little yoda-lookin' friend here. He's definitely one of the odder (or should I say udder?) characters out there. He's a little freaky... ok, he's a lot freaky. I get where they are trying to go, but when is a half man / half animal creature ever good? Oh sure, when the man half is on top, things might be okay, but when the animal half is on top, bad things always happen. 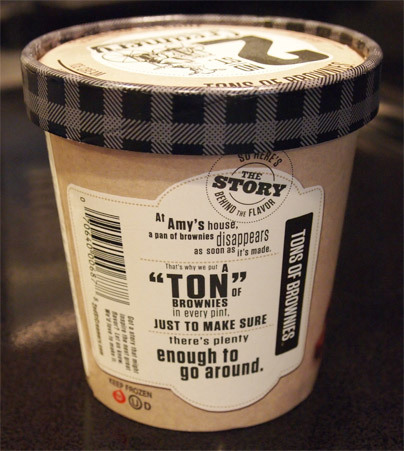 The back of the pint is definitely (less freaky) and more inspiring than the front. Don't get me wrong, I am enjoying the overall coloring and printing, it's definitely classic, but that doesn't mean I have to love all of it, nor does it mean the ice cream will taste any different. I just like to reflect now and then. Well four months of waiting is over. Hmmmm, ummmm, well, I don't know how I feel about that actually. That's one very dense ice cream. It looks like 2nd St is trying to be in Haagen-Dazs territory with this one. My word this swirl is solid, I can't get into it. Oooooo I'm so hungry and I can't scoop it. I don't want baby bites! Wait! We've got progress! Boy there are a lot of brownies in here! --- maybe I should say there are a "ton of brownies" and for the first time ever, I don't think "ton" is a fair name. "Wall to Wall Brownies" may have been an even better name. This is more like an ice cream filled brownie then brownie filled ice cream. Down sides? Besides the strange super frozen aspect of the center of the pint (the edges melted eventually). Well, I'm not sure I love the fudge swirl. I wish maybe it was a little sweeter and a little less potent, but we'll chalk that up to personal preference. It's not terrible, but I think it could be better. Other thoughts? The brownies are very very solid. I know ice cream is suppose to be good for about a year in a deep freezer, but they are solid and dry. Not that dry is a bad thing necessarily, I actually love dry brownie edges, so I won't fault them for that. They could have easily gone too gooey or too chewy. So, how do I feel? Silly for not letting this puppy melt and silly for waiting so long to eat it. I'm going to make sure this ice cream is ready before digging in for my second scoop. On Second Scoop: Ok, I was trying desperately not to be too hard on this ice cream yesterday but this one is just weird. I let this sit out for 10-15 (maybe even 20) minutes (uncovered) and the center is still rock hard. How does that even happen? 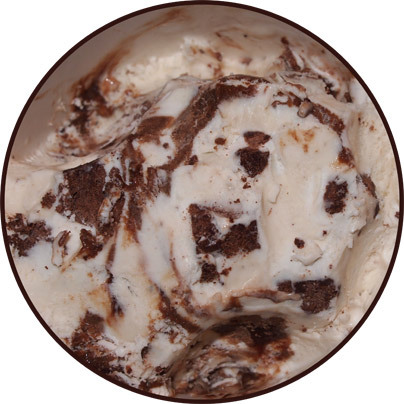 The fudge swirl is literally a quarter inch thick in spots, and much of it is staying solid. On occasion it melts, but most of it is solid, much like the very hard and dry brownies. Did all the moisture get sucked out of this pint? I just cant get into it. I can't even tell you how the base tastes because all I taste is unamusing fudge swirl. Here's hoping I just got a bum pint. I live in Iowa and have tried several of their flavors (the strawberry/rhubarb one and the hazelnut almond fudge one) and neither had any trouble melting in the middle. I've seen it at Shaws's and Walmart (since both are known for carrying Blue Bunny products). So whoever has BB in your area should have 2nd St. Cool, thank you. Out of curiosity, have you tried this one? I tried Copper Kettle Caramel (wrote to you) and this one. Tons of Brownies wasn't half as good as Copper Kettle Caramel. I thought maybe it was just me but your review confirms it. Try Copper Kettle Caramel. It's my favorite caramel ice cream ever. There's a gooey caramel ribbon and the base is incredible. Haven't tried this one...but I agree with TheHollows, the Caramel one is delicious. Have also had the cherry/chocolate one, which I thought was pretty good, and the mint cookie one - also good, but liked the other two better. 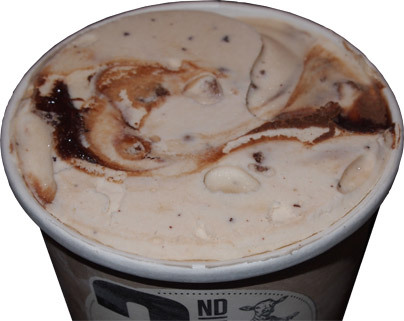 I have a pint of their ice cream (Truck Stop Fudge) and I just can't bring myself to really like it. It's been in the freezer for months, half finished, which is very weird for me because usually chocolate ice cream with marshmallow doesn't stay long in my freezer. It just doesn't taste right to me. I can't quite place it. And you are right, part of it is the rock hard texture. cool, I wanted to try that one next anyway! Late to the party! I agree that the brownie flavor isn't the best. I love copper kettle caramel. The swirl and the chocolate covered caramels have a perfect hit of salt for me, and there are a TON of the caramels in there. The hazelnut almond flavor is good as well. Basically...almond ice cream with Nutella swirl. The ice cream itself is a little gritty due to the almond, but I can live with that. Easily the worst ice cream I've ever had. If you can call it that. It is literally crumbly and I think my stomach hurts from it. I think I am officially turned off from ice cream for a while. Definitely would never give another flavor a second chance. Gross. Expensive and high calories for what? To feel sick. Ugh. you can give up on 2nd St, but never give up on ice cream! I must be strange but I loved it! I felt I was getting a bargain with the generous & delicious brownies & sauce. Personally I'm not a fan. I had the mint and it was totally lacking the mint flavor, it's completely overwhelmed by a crap ton of cookies and brownies. The cookie dough is no different.